‘No Content At All’ – sung to the tune of an ancient folk song, ‘No Hips At All’ (don’t ask!). I couldn’t get its tune out of my head while weeding my garden so here it is – rhizomatically hacked. who enrolled in a course with no content at all! What? No content at all! No content at all! then she reached for the content – no content at all! Teacher oh Teacher oh what shall I do? right into a course with no content at all? of artefacts made with no content at all! that a pie with no content is no good at all! Now I get back to my weeding! The Comment Collector has been generating brief summaries of most Rhizo15 WordPress and Blogger posts and comments by scanning and aggregating nearly 70 RSS blog feeds. The idea is to highlight centres of activity and discussion rather than aggregate whole blogs. Currently, the Collector displays new posts with or without comments for 3 days and posts with comments up to 10 days. Your opinions on any of the following or other aspects concerning the Comment Collector would be very helpful to me in deciding whether or how to develop the Collector. I have no intention to develop the Collector for any commercial purpose and Programming details are openly available. You are invited to comment below and/ or complete the poll. Do you look at the Collector output frequently or never? Does it provide you with a supplementary service or has it a distinctly different function from other facilities such as blog and twitter aggregation? Should the Collector give more information or less? Version 2 of the Collector can accumulate a considerable amount of data in machine-readable form (dates, identities, etc) making various types of analysis possible. What are the ethical (legal?) considerations? I am so pleased with the Comment Collector!! How can I ever repay you? No – don’t send money! …. but there is something useful you can do. I have been trying my hand at writing SF short stories – all readers have enjoyed my efforts! Both of them liked, Experimental Philosophy and Grandfathers’ Paradox but I seek a wider audience. Constructive criticism and comment is very welcome! I hadn’t really planned to unleash the Comment Collector on Rhizo15 but was pleasantly surprised when several participants seconded Simon’s request. Now Dave Cormier has asked about rhizo15 comments in comparison with rhizo14 so I’ve pulled out the graph I did for a 20 day period from the beginning of rhizo14 and compiled a similar one based on data collected so far for rhizo15. 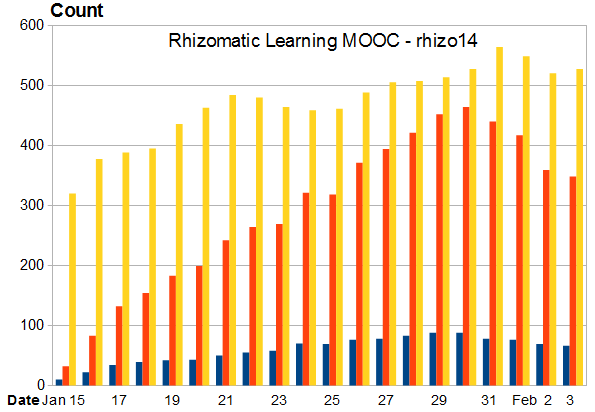 The graph above gives some idea of how commenting in rhizo14 developed with time. This was no scientific study, particularly for the first few days when blogs were being added and no posts were too dated to be lost from a time window that was still being adjusted. The period from Jan 23 2014 was more stable with comments collected over a constant 10 day period up to the date indicated. 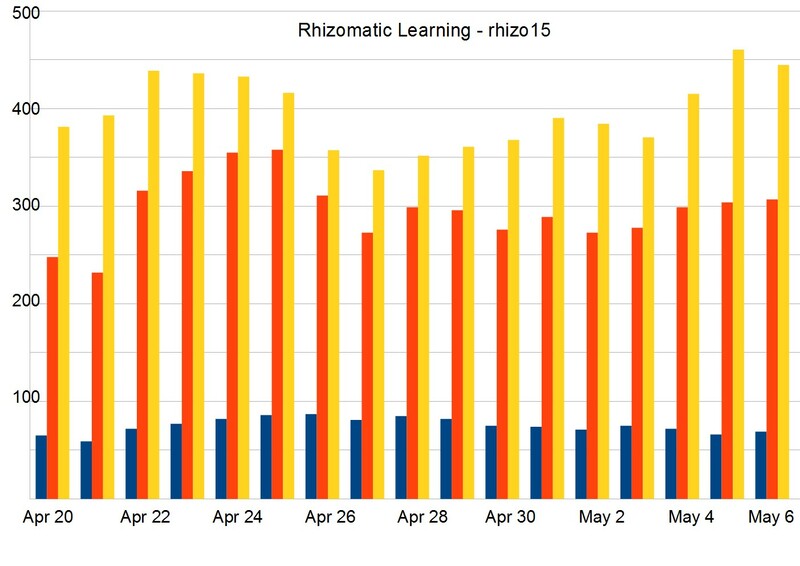 The rhizo15 graph covers a 17 day period from Apr 20 2015. These results are less reliable before Apr 22 when adjustments were being made, blogs added and the aggregation process just starting up. Although the number of posts (blue; over 10 day periods ending on the dates indicated) has dropped off by about 20% from a maximum of 87 on Apr 26, the number of comments (red) is roughly constant so the number of comments per post (yellow) has been rising reaching 4.6 on May 5. (NB: shown as 460 on the graph). Again, these results are more indicative of commenting activity among a sample of rhizo15 participants rather than a scientific study. Originally only 44 blogs were scanned but this has gradually risen to 68 as others were added. This has increased the number of posts and comments but should not have directly affected the ratio of comments to posts (yellow). In the next version of the Comment Collector all data will be stored in machine-readable form so that analyses of any type can be undertaken. (eg comments only on the original set of 44 blogs mentioned above or charting the daily incidence of new posts and comments.) Analysis raises a number of issues, including the ethical, that I’ve discussed a little in ‘Stitching Together the Fragments of a MOOC’ and ‘Collecting Connected Courses Comments (#ccourses)’ but have not really addressed yet. In any case, suggestions and comments on the performance of the Comment Collector ( rhiz015 output ) or its analytical possibilities are very welcome. Dave Cormier asks, “…what happens when we peek under the word ‘content’ to see what lives there?” Easy-peasy, the content of a course is simply what it contains. That’s what content means isn’t it? Dream up some learning objectives, concoct a curriculum with the bricks and mortar of texts, handouts, slides, videos, lectures, tutorials, build the course and Bob’s your uncle!. That’s what’s goes into the course so that’s its content. But what’s coming out? One learner’s saying, “Wow! – I got a lot out of that course – great stuff!” while another didn’t get anything much at all. Yet another has language difficulties but at least he improved his English comprehension. Someone else, was on Facebook most of the time during lectures but she was greatly inspired by one of the set texts. All were very concerned with one part of the so-called content, the examinable part. They persistently questioned the lecturer about it but she was strangely reluctant to pinpoint parts of the ‘content’, that slide or this video, that Must Be Known. Of course classifying the bricks and mortar of a course as content is wrong-headed! Bricks and mortar are there to support something else, but what? The content of a course is pretty much a subjective thing and that’s at least part of the problem. Maria from West Side story who knows her subjectives says, “…it’s true for you, not for me”. What’s in a course for you is one thing but what’s in it for others, including the designers of the course, can be quite different. What the designers believe they’re putting into a course can bear little resemblance to what you take out of it. In MOOCs, where little or no participant selection is the norm, the mismatch between learning objectives imposed by course designers and the multifarious objectives of self-directed learners is much more acute and this is barely recognised by MOOC providers that follow traditional instructional models. Their published objectives can be wildly out of tune with what many participants actually get out of these xMOOCs. The vast majority of participants are often labelled ‘dropouts’ because they don’t jump through the given hoops although at least anecdotal evidence suggests that many still benefit educationally one way or another. Do you believe in learning from MOOCs? What do you see when the content is free? Change: Education, Learning, and Technology!